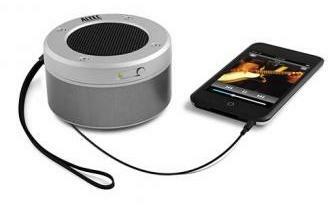 With the explosion of iPods and MP3 players, portable music has become an ever-greater part of people's lives. For the most part, people listen to their devices with either headphones or an elaborate home theater hook-up. But what of the middle ground? What if one prefers to listen to music without headphones, and as simply as possible? More to the point, given that music is so portable today, what solutions are there for speakers that are just as portable as the players? On the upper end of the spectrum, the Pure-Fi is not something you'd carry around in a pocket, purse or likely even an attaché. It's more something to pack in a suitcase, or use for portable home speakers, as you move from room to room. Still, it's highly portable. Logitech has a good history with such "transportable" speakers. The Pure-Fi line replaces the popular mm50 - as well as the early mm28, which I tested several years ago and loved. The new line does some things better, though drops a few preferred features. Obviously, no portable speakers, even the larger ones, are going to compare with a home theater, and the Pure-Fi isn't going to satisfy audiophiles. But the sound is very good, the best of the lot here: crisp, strong, and has respectable bass, though it's not rich. The treble is clear, and there's no noticeable distortion. (It features 2" drivers for high-excursion, and 3" drivers for bass.) Most notable is "Stereo XL," which is separation for simulating wide sound. This isn't appropriate for all music, but the quality was wonderful, some of the best separation I've heard, especially for portable speakers. As for portability, the Pure-Fi has several good features. A built-in rechargeable battery is rated for 10 hours, though that mileage will likely be high in normal usage. (It's worth noting, as well, that the Pure-Fi doesn't appear to hold a charge all that well when sitting on the shelf.) Also nice is that it comes with a carrying case, wall-charger (that has fold-away pins, which I love and am always surprised that more vendors don't use them), and a handy remote control. More on that in a bit. Everything fit neatly in the case. The device comes with iPod dock connectors, and is the only device tested here that will charge your iPod while playing. It's important to note that it will only charge when the Pure-Fi is plugged in. (Oddly, this isn't mentioned anywhere in the documentation.) However, the Pure-Fi is not limited to iPods -- you can play any MP3 device through the auxiliary input port. (No connecting cable included, though they're inexpensive to purchase. On the other hand, the old mm28 had a cable attached to the player and hidden away. It was a great touch and missed here.) Note that it doesn't charge other MP3 players, just iPods. The Pure-Fi has a clean, elegant look. There are handy, twist-out metal legs for balance, and a battery level indicator, which most devices lack. The device doesn't have player controls - for that, you use your iPod or MP3 directly. Oddly, though, the unit does have volume and random/repeat buttons. 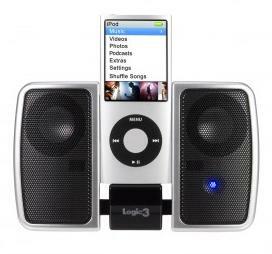 You can also, however, play music with a remote control, which few portable speakers offer. It works quite well, though there was occasionally a slight lag after clicking an action. It's solidly made with crisp buttons (although they have a slightly plastic snap). The range is about 15-25 feet. The Orbit 237 is sort of a hybrid. While not tiny pocket size, it's definitely small. It's more something for a bulky jacket pocket - or purse or attaché. Yet the sound quality is very good - vibrant, loud and clear with no noticeable hiss, albeit mono. Still, the richness and warmth for such a small speaker is noteworthy. It delivers a pleasant bass, but is not strong there as with treble. Shaped like a fat disk, it's laid flat and provides "360 sound" in all directions. In fairness, obviously, all good speakers should be heard well through out a room. Still, this is evenly distributed. Because it connects to music players through their earphone jack, it's appropriate for any MP3 or iPod device. It can also be connected to notebook, of course, to expand on the computer's built-in speakers. The connecting cord is very short, but it conveniently wraps up underneath the base and hides away. You control sound directly from your music player, not on the speaker. It can't really boom sound, but make no mistake, it definitely can get loud. The Orbit 237 comes with a carrying pouch and uses three AAA batteries. The only real quibble is a minor one: the On-off button that doesn't recess all the way when off, so it could be left on by accident if you don't double-check. At the time of writing, it retails for $40, though sells for $27 on Amazon. A year ago, I reviewed an amazing portable speaker, the X-mini. 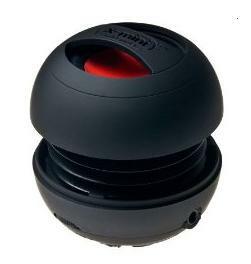 The size of a golf ball, it had impressively strong sound for such a tiny speaker, and respectably crisp clarity. It's been upgraded and reviewed below. The iHome iHM 77 is a cousin to that with a few differences, perhaps the most valuable of which is it's much easier to find in the U.S. The iHM 77 doesn't provide serious bass, and is a little thin - but it's quite good and powerful for speakers this miniscule, loud enough to fill a small room. And the stereo separation was impressive. The biggest downside is that there was a slight hiss during quiet passages at high volume, though at other times it wasn't noticeable. But overall, the stereo sound and power of speakers this tiny is surprising. The iHM 77 are real stereo speakers. To use them, you easily snap the speakers apart, and then twist each one to expand their size for a slightly richer sound. A cord wrap is provided, which you then unravel and connect the plugs between the speakers and your music player. This is perhaps my biggest quibble - it hardly a problem at all, but unwrapping the long, split cord gets a little messy. Each speaker has its own built-in amp powered by a Lithium ion battery that's rechargeable via USB connection. (The aforementioned cord also includes a USB plug.) Everything fits neatly in the provided cotton pouch. The iHM 77 can play any portable device, connecting to the 3.5 mm earphone port. For that matter, you can also plug it into the USB port of a notebook computer and likely get better stereo than what's built into the system - which could be one of its best uses. The speakers will never be confused with home theater sound or a replacement for high-end speakers. But for sheer portability combined with stereo sound, the iHM 77 does a very good job. At the time of writing, it retails for $50, and sells for $40 on Amazon. At first glance, the iStation Traveller doesn't grab your attention. Called a compact portable speaker system, it's about the size of a thick cigarette case. 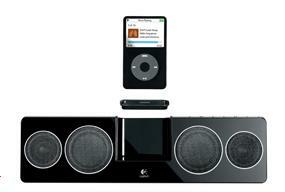 Slide the two speakers out, and a docking area appears for your MP3 player. Snap the 3.5 mm plug into the earphone jack. Simple, nothing special. Then the sound comes on - and it booms out, filling the room with a very good sound quality. Solid bass, nice treble, a bit more brassy than warm. There's a little hiss at the low-end bass, though it's only noticeable when the music is quiet. The stereo separation isn't especially wide, but it's definitely there. To be sure, like all ultra-portables, this can't be compared with good speakers, but you buy something like this for the size. To have sound this good in a package that can fit in your pocket is an unexpected bonus. 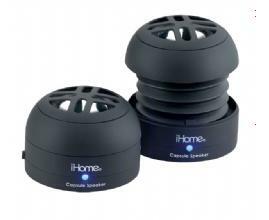 Though larger than the iHome iHM 77, its flat shape actually fits in one's pocket - a bit snugly but comfortably enough. Because the i-Station Traveller uses a 3.5 mm plug, it connects to any iPod or MP3 player, and the attached cord nice hides away in the device when not being used. Also included is an adapter plug so it can work with mobile phones. My biggest issue with the Traveller is the design. Mind you, there's a cleverness to its compactness. But while intended to have one's music player sit between the speakers, it's not all that stable unless sitting on a sturdy surface. (Obviously, that will usually be the case, but not always. You may prefer to remove your player and lay it flat instead.) Also, the cord is a bit short - though it should reach most players, another inch for comfort would have been much nicer. And for something so highly portable, it's not something you'd want to carry around listening to music. It's made to be set down on a desk top. To be clear, none of these are especially problematic, the good sound and compactness trump them by far, just worth noting. It's definitely available though and worth the effort looking. For all its design issues, the i-Station Traveller is compact and exceedingly convenient to use, and the sound so strong. At the time of writing, it sells online for $24. Note that Logic3 makes a somewhat-similar iPod-only version, which might be easier to track down. The original X-mini was one of the more impressive portable I'd come across, in its combination of size and sound quality. About the size of a golf ball, it had a booming, surprisingly clear and solid sound, a bit more on the treble side. It was also extremely well-made, with a very solid feel, a trait that continues with the X-mini II. An important note here. Most small, portable speakers have not volume control, and require adjusting the sound on your MP3 device. The X-mini II, however, does have a volume control, which is a wonderful new feature. But - it's not mentioned in the documentation, and it's recessed on the side, and blends into the unit and is hard to miss. To properly use the X-mini, you twist its ends and pull it apart a few inches. This releases an accordion-like "vacuum" tube which is like a sub-woofer and provides a richer base. Often I find that the sound is pretty similar whether or not you open the device, but for certain music the base does become more pronounced. There's another very nice addition with the new model - the 3.5mm -plug that connects to your iPod (or any MP3, since it attaches to the speaker jack) is now built into the unit. No more having to carry around a separate cord and risk losing it. When done, it just folds neatly into the X-mini II. There is a separate cord, but that's used to connect to a USB port for charging. It can be kept in the unit's carrying sack. Related to this built-in plug, the X-mini II has a new capability - you can now "daisy chain" the speaker. Each device has its own Buddy-Jack (basically, an earphone jack), into which you can plug another X-mini II (or X-mini Max, reviewed below, which also has a Buddy-Jack) - this will expand the volume significantly. In fact, you can daisy chain as many of these speakers together as you like - or connect any speaker with a 3.5mm plug - and create a booming sound. Additionally, the company says that playback time is now rated at up to 12 hours. Whether you'll get this much, it's still much longer a rating (three times longer) than the original model. With excellent sound quality in base and clarity, loud playback, a volume control, much longer battery life, a built-in plug, and the ability to daisy chain, the X-mini Capsule Speaker II easily tops what was a wonderful original. The only thing close to a negative is that it's just slightly larger - but then that's what allows for many of the improvements. (One other quibble, that borders on the insignificant, but it deserves mention: the manual is written in pathetically miniscule typeface.) It retails for just $29. As long as we're dealing with portable sound options, it makes sense to include the most basic and traditional - headphones. Earbuds, of course, are prevalent everywhere, and the sound is respectable enough for what people tend to look for in most mid-range models, which are cheap. But sometimes, you want something higher quality. Further, the biggest hindrance for earbuds is listening to music in noisy areas, most notably on airplanes. The problem here, though, is that noise-cancelling headphones tend to cost in the upper end. Audio-Technica has a line noise-cancelling headphones, however, that slides into that slot, what the company calls its QuietPoint® series. What differentiates the range of its models is how much noise cancellation each headphone provides, from 80% up to 90%. Though the lower end models provide noticeable cancellation, I found that the top-of-the-line model not only delivered the most cancellation, but actually had better acoustics, period. It turns out that that's because different technical specs are used in making them. To use noise cancellation, it requires installing a single A battery, by twisting off the cover of one of the muffs. Then, just flip a switch, and you're set. Testing the headphones on an airplane flight, they delivered extremely solid noise cancellation. Very little extraneous sound made it through, and the acoustics were clear, crisp and bright. Base and treble seemed to come through well, considering the pummeling engine noise all around. The cushions cover your ears completely, and the headphones were quite light and sat comfortably for several hours. Longer than that, I found that I had to briefly remove them and briefly rest my ears. That will be true with any headphones, and many required ear-resting much more often. There was one oddity with the Audio-Technicas, and one quibble. The oddity is that the sound was noticeably better when noise-cancellation was on. When turned off, the sound was a bit muted, even when not in a normal environment. So, you might find that you'll just want to always listen with noise-cancellation, regardless of the outside sound. The only downside of this is that it will use up the battery life more quickly. The quibble is that, unlike some other headphones, these don't fold up compact for storage. And the protective carrying case is fairly bulky. So, these take up a fair amount of space in your carry-on. On the other hand, the case is very well-made and does provide a lot of protection for a fragile product. (I've had a headphone once snap when in a small sack and accidentally crushed.) And there also pockets for batteries, different-sized plugs, and cords. There's even enough room to store your MP3 player. So, there are upsides to this bulkiness. The Audio-Technica ATH-ANC7b headphones don't provide The Best Sound in noise-cancelling headphones, but those might cost you a month's rent. And you can get a lower cost headphones from Audio-Technica in their QuietPoint® line. But for the $130 these are currently selling for (at the time of writing) on Amazon, it's an excellent combination of sound and price, while keeping the quibbles in mind. To see this column with extended product graphics and additional "TWW Notes," visit the WGA website.